Swaddling babies helps them fall asleep faster and sleep for longer, especially overnight. At some point, though, your baby will outgrow swaddling. Either they kick out of it every time or simply don’t fit into any blankets or velcro swaddlers any longer. When this happens, it’s time to move to the baby sleeping bag, also called a sleep sack. Sleep Sack or Sleeping Bag? Baby sleep sacks and sleeping bags are very similar in appearance. Both are usually zippered and have either arm holes or long sleeves for your baby’s arms to go through. The legs are loose inside the zippered section, which keeps them warm but lets your baby move around more. A sleep sack is usually cotton or flannel; many of them have sleeves to make a sort of wearable baby blanket. 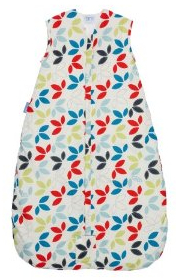 Baby sleeping bags have a wider range of sizes and designs; usually they’re multi-layered and thus a bit pricier. They even make “baby” sleeping bags for older children to take to preschool for nap time. Otherwise, baby sleep sacks and baby sleeping bags are pretty much the same. Halo makes a variety of sleep sacks for newborns and older babies. These are designed to be worn over regular sleepwear and take the place of loose blankets, which you aren’t supposed to have in the crib. Like I said, these allow room for your baby to kick, but they can’t be kicked off so they’ll continue keeping your baby warm overnight. One feature that I do like is the reverse-zipper: it zips from the neck down, so that you can make a diaper change without taking your baby out of it. These are used by hospitals all over the U.S. and Canada, in part to promote safe sleep practices. In fact, two of our boys’ sleep sacks are made by HALO, and they’re embroidered with Back to Sleep, the slogan of the national sleep safety campaign. If you buy one through Amazon, a portion of the sale goes to First Candle/SIDS Alliance and The Canadian Foundation for the Study of Infant Deaths. A ladybug applique that says Snug as a Bug. Shiny, silvery circle appliques on the front and back. 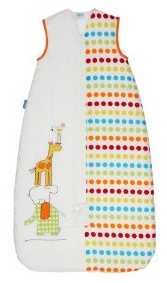 Grobag makes several baby sleeping bags and their patterns are adorable! 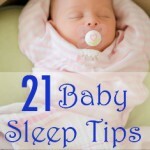 Most of them are 2.5 tog, which indicates a thickness that your baby can wear year-round to sleep at night. It’s 100% woven textured cotton with applique and embroidery details, 100% super-soft jersey lining, quick dry polyester filling on the 2.5 tog. The 6-18 month and 18-38 month sizes have front zips with zip clicks; a cover on these prevents your clever little ones from opening their bags. 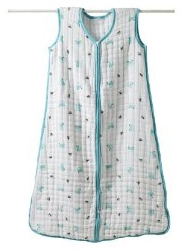 One of the best features of these baby sleeping bags is that they’re machine washable and can tumble dry on low. Grobag is all about baby sleep safety and includes a booklet of safety guidelines with every bag. You might recognize aden + anais from their widely popular baby swaddling blankets, which I’ve already reviewed (and praised) elsewhere on my blog. This is a great fabric because it’s woven to be extremely breathable, which makes this sleeping bag one of the safest you can get. It’s incredibly comfortable for babies (and adults), and becomes even softer the more you wash it. It turns out that they also make sleeping bags of the same material. The also zip from the bottom as well to allow diaper access. If the swaddling blankets are any indication, the Aden+Anais sleeping bag is probably the most comfortable baby sleeping bag out there. Oversized, glow-in-the-dark zipper. Now there’s a feature that any parent can appreciate, especially those of us who have stumbled into the nursery in the middle of the night to soothe a crying baby. 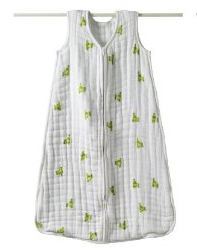 The Baby Deedee Sleep Nest is a quilted sleeping bag for babies and toddlers 0-36 months. Unique shoulder snaps make it easy to place baby into the sleep nest, even while sleeping, in just 2 easy snaps. I loved this feature in our Deedee sleeping bag and regretted the day that our boys grew out of it (they’re in Halo sleep sacks now). For pure ease of use, the Deedee Sleep Nest definitely wins the prize. This chart, adapted from the one provided by Baby Deedee, will help you choose the right size sleep sack or sleeping bag for your baby. A word of caution – they’ll fit into a slightly oversized sack, but won’t tolerate one that’s too small. So buy big! 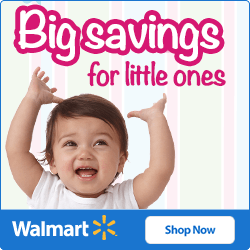 Which Sleep Sack for Your Baby? 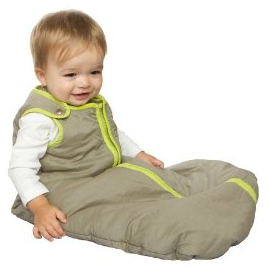 So which sleep sack or sleeping bag is right for your baby? Here’s my 30-second summary. 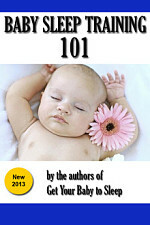 The Halo sleep sack is your basic model, the top seller, where part of the proceeds goes to promote baby sleep safety. 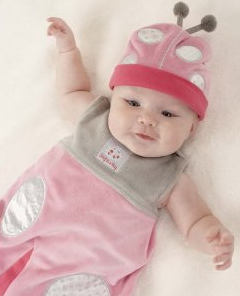 The Baby Aspen ladybug sleep sack makes your little one into a cute lady bug! Guaranteed to win all of the “cutest sleeping baby” prizes. 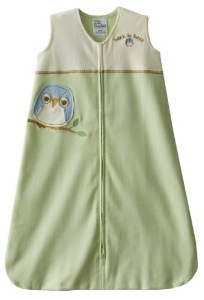 Grobag sleeping bags have many adorable patterns and can be put in the dryer. 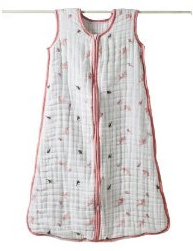 Aden & Anais sleeping bags probably offer the best comfort due to the breathable muslin material. The Baby Deedee sleeping bag is for light-sleeping babies: it’s easy to put on and take off, with its oversized zipper and unique shoulder snaps. Even if you’re still swaddling your baby, go buy one of these now! You’ll want to have it ready when he or she starts kicking out of the swaddle.